Ayub Khokhar and his talented team at Little Chef Indian Restaurant. After cooking delicious meals for 25 years in various hotels and restaurants, chef Ayub Khokhar has finally fulfilled his life-long dream by opening his own restaurant. Last year he opened Little Chef Indian Restaurant at Belmont and he delights in serving local customers. Ayub is a professionally-trained chef who started his career in Pakistan, and has been cooking in Geelong for more than 10 years. Wherever Ayub has been chef, he has developed a following for authenticity, taste and the quality of his cooking. Now head chef in at his new restaurant, Ayub and his family warmly invite Geelong locals to experience his fine cooking. His restaurant serves nearly 100 different menu options and local customers are certainly enjoying his food if online reviews are anything to go by. 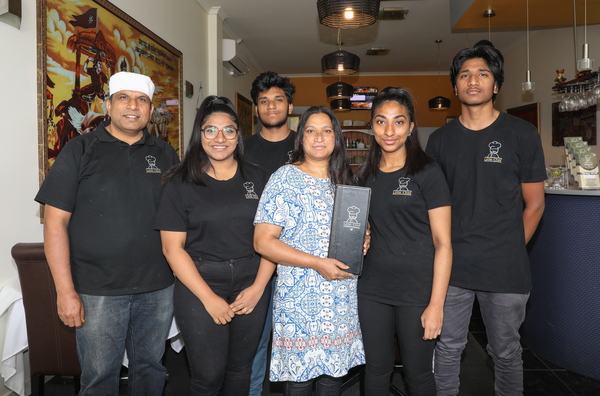 “Little Chef serves authentic Indian food that is heaven to taste buds and not heavy on the pocket,” one customer commented. The restaurant offers a 10 per cent discount on takeaways and can deliver meals to the doorstop. “Don’t feel like stepping out? No worries! We offer free delivery within 5km for orders above $40,” Ayub says. The restaurant is gluten and vegan friendly, uses only halal meat and has great options for younger diners. “At Little Chef, we welcome our little guests with chef’s special kids’ menu,” Ayub says. Little Chef has BYO wine and is fully licensed.